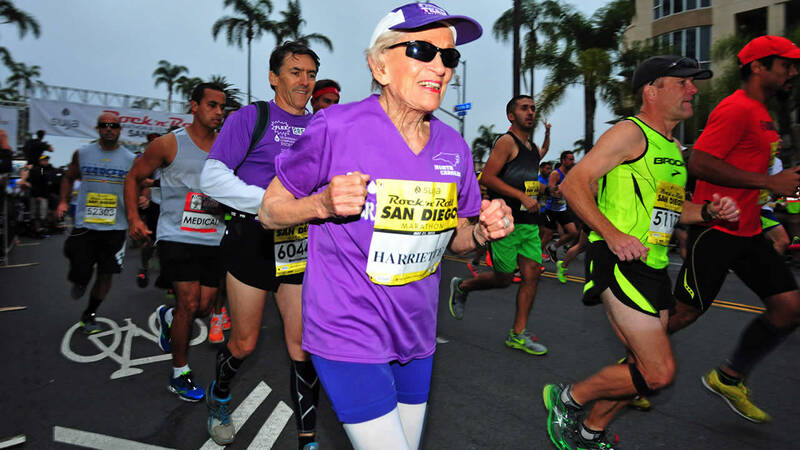 SAN DIEGO -- A 92-year-old cancer survivor rocked her way into the record books Sunday, becoming the oldest woman to finish a marathon. Harriette Thompson of Charlotte, North Carolina, completed Sunday's Rock 'n' Roll Marathon in San Diego in 7 hours, 24 minutes and 36 seconds. She was mobbed by well-wishers as she crossed the finish line. "I'm fine, they're really pampering me here," Thompson said in a firm, joyful voice as people all around her shouted congratulations. This was her 17th Rock 'n' Roll Marathon and, by far, the hardest. "It's always harder but this year has been a bad year for me," she said, adding her husband died in January following a lingering illness and she battled a staph infection in one of her legs. "I couldn't train very well because my husband was very ill and I had to be with him for some time and then when he died in January I had some treatments on my leg," she said. "I was just really thrilled that I could finish today." Despite her training woes, she nearly matched her finish time of last year, which was 7 hours, 7 minutes and 42 seconds. That set a record for a woman 90 or older, shattering the old one by more than an hour and a half. A classically trained pianist who played three times at Carnegie Hall, Thompson says she mentally plays old piano pieces she had performed to help her get through the 26.2 miles. She didn't begin running marathons until she was in her 70s, after a member of her church approached her about being one of her sponsors in the marathon to raise money to fight leukemia and lymphoma. "At that time I had lost several people in my family to cancer and I said, 'Oh, maybe I should do that," she recalled. "When I got out there the first year I just planned to walk it, but everybody else was running so I started to run with them." She isn't sure if she'll run again next year. But after last year's race she wasn't sure she'd run this one either. "I don't think I'd be living today if I didn't do this running," the cancer survivor said. "I'm helping them and they're kind of helping me."